Earlier this year, the Los Angeles Police Department commemorated its 140th year of service to the citizens of this great city. Throughout this historic time, both the Department and the Los Angeles Police Historical Society have endeavored to highlight the history that has been compiled by many hard-working men and women. The stories have been shared in classrooms, board rooms and over the phone lines. Some are widely known, others are not so familiar. Whatever the case, it has been a time to celebrate 14 decades of accomplishment. On September 12, the Historical Society took some time to honor a number of people who have supported the Department and the Historical Society by presenting each with a Jack Webb Award. It was the sixteenth time the Historical Society has hosted this wonderful event. Bestselling author James Ellroy once again stood at the front of the Sheraton Universal’s grand ballroom, eloquently handling his emcee duties. For 2009, the Historical Society was privileged to honor Margot Armbruster, retired Chief Daryl Gates, Father Michael McCullough and the writers and creators of Police Story. All of the honorees are known for their deep community involvement, and in particular their sustaining support of the Los Angeles Police Department. First Assistant Chief Jim McDonnell presented the Jack Webb Award to Margot Armbruster who is known as a dedicated community leader. Besides supporting the Historical Society, Margot devotes a considerable amount of her time to the boards of the Police Foundation and the Police Memorial Foundation. Her involvement in these causes and their projects has made the LAPD a better place. Margot’s concerns also involve some other important interests. Margot is actively involved with the board of the Greater Los Angeles Zoo Association, and is a Trustee of Saint John’s Health Center in Santa Monica. Hers is a life of great involvement and great achievement. For that the Historical Society proudly presented Margot Armbruster with a Jack Webb Award. Certainly 140 years of police service is a source of pride for the LAPD as a whole. 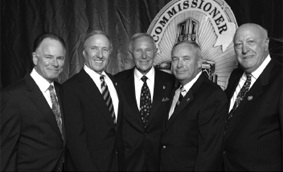 Sixty years of association with the LAPD is also a notable accomplishment. This achievement was realized by retired Chief Daryl Gates recently. His active service stretched through 43 years, and for the last 17 he has been involved in many other projects to support the Department. Chief Gates remains a prominent figure in law enforcement circles throughout the country, enjoying a reputation for leadership and innovation. Chief Gates championed the SWAT concept and pioneered the DARE program. His successful policing model for the 1984 Olympics safeguarded the citizens of LA, as well as international visitors and athletes. His term as Chief of Police has only been exceeded by one other man, his mentor, Chief William H. Parker. Chief Gates’ contribution to law enforcement has been remarkable. A roll call of former SWAT officers stood in support of Chief Gates while retired SWAT Sergeant Ron McCarthy presented the 2009 Jack Webb Award. 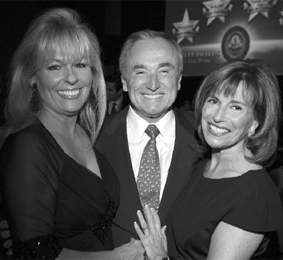 Margot Armbruster celebrates her Jack Webb Award with Chief Bratton and his talented wife, Rikki Klieman. Shortly before Chief Gates took office, Michael P. McCullough joined the LAPD ranks as a chaplain. Father Mikeâ€ as he is more widely known has been ministering to Los Angeles police officers for more than thirty years. Father Mike was the first priest to graduate from the Reserve academy, and an integral part of the Crisis Response Team. Through this role and his association with the FBI, Father Mike has ministered to those in need at countless incidents including airliner crashes, line of duty deaths, and the tragic events of 9-11. Father Mike’s peers honored his achievements in 1998 when he received the International Conference of Police Chaplains highest honor, the John A. Price award. Closer to home, Father Mike established and administers the Desert Refuge for Peace Officers, a non-profit ecumenical retreat facility in Joshua Tree. This worthy and noble undertaking allows police and veterans’ families to maintain their spiritual health. The sum of these contributions to the law enforcement profession is truly notable. South Pasadena Chief of Police (and retired LAPD Commander) Dan Watson presented the Jack Webb Award to Father Mike. The final presentation was made to a group of people responsible for an innovative 1970s crime drama. Police Story was conceived by bestselling author and former sergeant, Joseph Wambaugh. David Gerber brought the great stories of the LAPD to the TV screen. Many of the biggest stars of the day played roles in the various Police Story episodes. More notable was the behind-the-scenes participation of LAPD personnel such as Deputy Chief Stephen Downing, Joe Gunn and Richard Kalk. This emmy winning series cleared the way for such successful series as Hill Street Blues, NYPD Blue and Homicide: Life on the Streets. Police Story’s depictions of LAPD life helped advance an understanding of the challenges faced by LAPD officers, and greatly publicized the D e p a r t m e n t ‘ s professionalism and pioneering spirit. 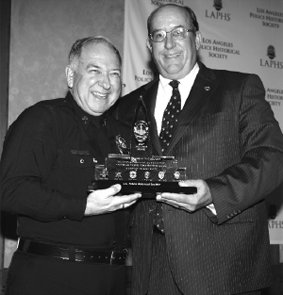 In addition to the involved LAPD personnel, 2009 Jack Webb awards were presented to Police Story producers and writers Stan Kallis, Bob Collins and Jerry Ludwig. Each received the Jack Webb from one of the Historical Society’s great supporters, Chief William Bratton. The Historical Society is always pleased to recognize those who support the front-line of public safety. It takes many people to ensure the success of the event, and this year we owe a great deal of thanks to Mayor Antonio Villaraigosa for his remarks, James Ellroy for his unparalleled skills as an emcee, the LAPD Color Guard, Sky Green, Chaplain Frank Hicks, Bert and Jane Boeckmann, LAPM Chairman Greg Meyer and the ceremony’s co-chairs Jay Grodin and Danny Staggs. Our thanks also go out to those who supported the event through their attendance. The cover story of this publication tells of the Historical Society’s efforts to honor those who have distinguished themselves through a sustaining commitment to law enforcement. A beautiful acrylic rendition of city hall with representations of LAPD’s six badges embedded is presented to each one. It is truly an honor to present these awards in the name of Jack Webb. It was also an honor to be involved in the much grander recognition of Jack Webb when the commemorative stamp bearing his likeness was revealed on August 11th at the Police Academy. The First Day of Issueâ€ ceremony was an overwhelming success, and it was the first in a series of special events the Historical Society had on its recent schedule. Photos of the many activities are featured throughout this newsletter. 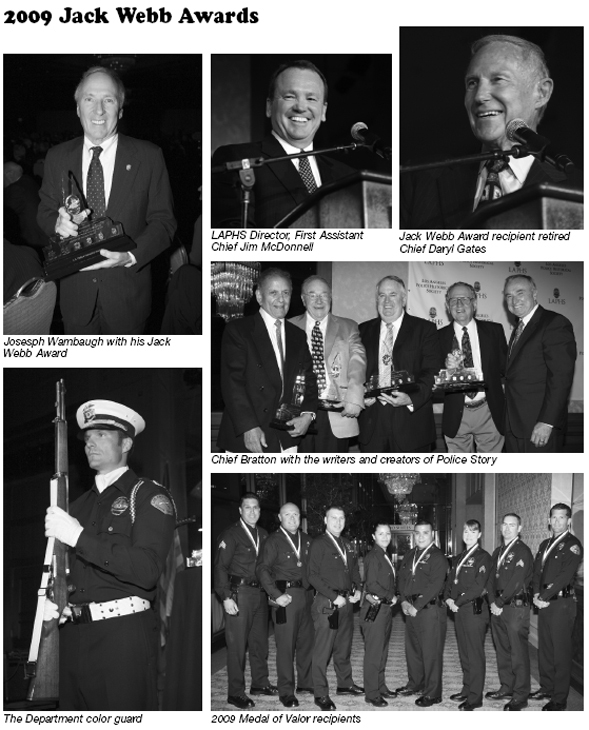 In the days following the Jack Webb Awards, an LAPM contingent, along with retired Chief Daryl Gates travelled to San Diego to receive an award from the San Diego Police Historical Association. Last year, our counterparts in San Diego opened their own police museum. Throughout their existence, LAPM has lent a hand with the various phases and facets of the San Diego development. LAPM was recognized for the services rendered to the San Diego Police Historical Association. Not long after the LAPM crew returned from San Diego, representatives of LA County law enforcement and public safety stopped by the museum. The Peace Officers Association of Los Angeles County held their regularly scheduled meeting amidst the second floor exhibits. District Attorney Steve Cooley presided over the meeting, and LAPD was ably represented by Assistant Chief Sharon Papa. Key representatives from a number of law enforcement agencies and the private sector were allowed to experience the museum once the meeting concluded. Chairman Greg Meyer, Joseph Wambaugh, retired Chief Daryl Gates, Keith Bushey and Richard Kalk accepted an award from the San Diego Police Historical Association on behalf of LAPM. On October 2nd, the Historical Society participated in the Motor Officer Centennial at the Elysian Park Academy. One of the museum’s motorcycles was rolled out for display at the event. Plenty of photographs were provided to support the event, and Historical Society staff and volunteers staffed a booth at the event. An impressive amount of motor officers participated, including the Department’s highest ranking motor officer, LAPM Director and Deputy Chief Terry Hara. This was truly a once in a century gathering. Only days later, it was an impressive amount of vintage police vehicles that assembled for another interesting occasion. October 4 is 10-4 day, which means a parade through Hollywood. Organized and presented annually by Councilman Tom LaBonge, 10-4 day honors law enforcement, with a focus on the California Highway Patrol. Shotgun Tom Kelly served as the master of ceremonies, and a presentation was made to the 11-99 foundation of the CHP. Councilman LaBonge also presented the Historical Society with a resolution honoring the storied history of the LAPD. The parade began at Fire Station 27 and featured a code-3 run to Broderick Crawford’s star adjacent to the Chinese Theatre. Plenty of vintage LAPD cruisers were photographed during the visit to the walk of fame. Even though these interesting events have kept the Historical Society busy, there are still some more to come. The evening of October 14 features the unveiling of the new Police Memorial at the new police administration building. Ten days later, the building itself will be publicly unveiled. Then, on the 19th of November, a ceremony honoring Commander Paul Gillen, who was killed in a line-of-duty helicopter crash in 1974, will be held at the monument. After the activities at the new monument conclude, Commander Gillen’s photograph will be hung in the new offices of special operations bureau, as a lasting tribute to his LAPD service and sacrifice. Sadly the loss of Commander Gillen is not the only one that has impacted the Historical Society lately. Another important member of the extended LAPD family passed away recently. Marguerite Justice, a former Police Commissioner, and avid LAPM supporter, died on September 17th. At her memorial service, she was remembered by First Assistant Chief Jim McDonnell, retired Chief and Councilman Bernard Parks. Retired Chief Daryl Gates served as an honorary pallbearer. Mama J’s service to the commission was truly historic. 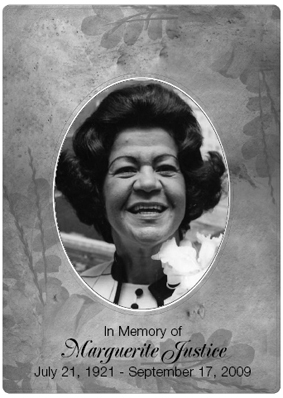 Our memories will include the smile and grace reflected in the photo of Mama J above.